Fortnite’s big space mystery continues to ramp up and baffle people. Today, players looking up will notice there’s not just one comet, but rather a variety of burning objects falling from the heavens. But what does it mean?? 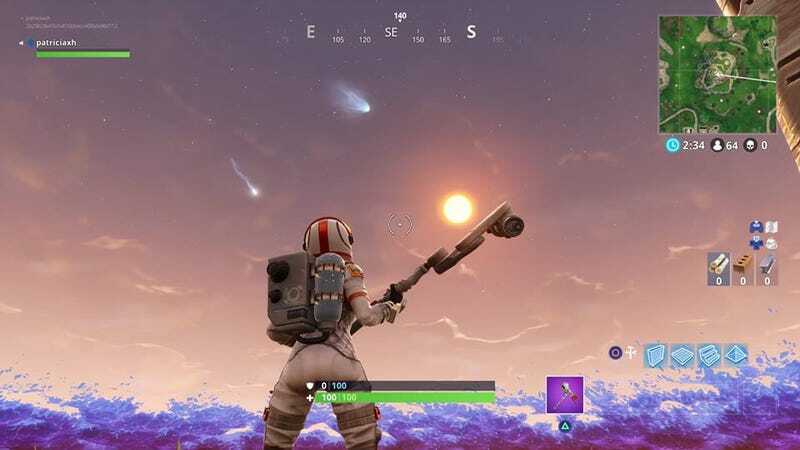 Since yesterday, all Fortnite chatter has revolved around one thing: players believe that the comet will likely strike the map today. So far, that hasn’t happened, but things do seem to be progressing. I heard players buzzing about even more meteors today, so I booted the game up and landed on a high peak. Sure enough, over the course of a single game, I saw about four smaller comets burning into the atmosphere. They didn’t seem to hit anything in particular in my game. Elsewhere, players are uploading videos of comets in their own matches. Thanks to the wonders of the replay system, we can take a closer look at the falling meteors. In Pierce Morgan’s footage, you’ll note that the meteor fizzles out after a while. While it’s possible that something will happen here, I’m still feeling skeptical it has anything to do with Tilted Towers. The original theory came from a Reddit post that suggested that Tilted Towers should get leveled, and while Epic sometimes updates the game with things that players ask for, getting rid of an entire area seems like a huge ask. The stuff Epic has indulged players in the past has included things like weapon tweaks, new loading screens, and earlier today, a sweet in-game message. Nothing on the level of destroying a map area—which, by the way, was only added somewhat recently. My guess, and I could be wrong here, is that the the Tilted Towers conspiracy theory won’t come to pass. But who knows. Out of curiosity, I played a second game and headed straight to Tilted Towers. So did half of my lobby, actually, and a good percentage of those players didn’t start murdering each other immediately. Folks seemed to land there to see if the chatter about Tilted Towers going down was real. During my time on a rooftop there, I did notice a couple of meteors that seemed to come close, but also a few that weren’t going in my direction at all. When asked about what was going on and if it had anything to do with Tilted Towers, an Epic representative joked that they couldn’t read my email. What are you hiding, Epic? Guess we’ll have to wait until the end of the current Fortnite season to see.